การประท้วงเพื่อต่อต้านรัฐบาลทหารพม่า คือการประท้วงที่นำโดยคณะพระภิกษุสงฆ์ แม่ชี นักศึกษาและประชาชน ซึ่งเริ่มต้นตั้งแต่วันที่ 15 สิงหาคม พ.ศ. 2550 จากการไม่พอใจของประชาชนต่อการประกาศขึ้นราคาน้ำมันเชื้อเพลิงเกือบเท่าตัว และขึ้นราคาก๊าซหุงต้มถึง 5 เท่าอย่างฉับพลันโดยมิได้ประกาศแจ้งบอกของรัฐบาลทหารพม่า การประท้วงเริ่มรุนแรงขึ้นเรื่อยมา จนถึงวันที่ 5 กันยายน มีการชุมนุมประท้วงที่วัดแห่งหนึ่งในเมืองปะโคะกู ทางตอนกลางของประเทศ เจ้าหน้าที่เข้าสลายการชุมนุม และมีผู้บาดเจ็บจำนวนมาก รวมทั้งพระสงฆ์จำนวน 3 รูป สื่อมวลชนบางแห่งเรียกเหตุการณ์ครั้งนี้ว่า Saffron Revolution หรือ "การปฏิวัติผ้ากาสาวพัสตร์"
↑ "Military junta threatens monks in Burma". ↑ "100,000 Protestors Flood Streets of Rangoon in "Saffron Revolution"". ↑ The hardship that sparked Burma's unrest BBC, 2 October 2007 Archived 21 October 2007 at the Wayback Machine. ↑ "Asia Times Online :: Southeast Asia news - Fuel price policy explodes in Myanmar". atimes.com. สืบค้นเมื่อ 16 May 2015. ↑ 20,000 March in Myanmar protest. Archived 12 October 2007 at the Wayback Machine. ↑ 100,000 protest Myanmar junta CNN, 24 September 2007. Archived 25 July 2008 at the Wayback Machine. ↑ "Burmese military threatens monks". BBC News. 24 September 2007. สืบค้นเมื่อ 1 January 2010. ↑ Myanmar junta sets curfew Reuters, 25 September 2007. ↑ "Pro-democracy politician arrested in Myanmar". สืบค้นเมื่อ 10 April 2009. ↑ Jenkins, Graeme; Paris, Natalie (26 September 2007). "Burma troops charge monks with batons". The Daily Telegraph. London. สืบค้นเมื่อ 22 April 2010. ↑ Burma riot police beat back monks BBC, 26 September 2007. 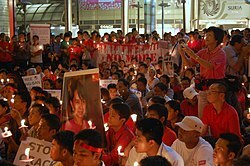 ↑ Over 100,000 people in Rangoon and parts of Burma protest Mizzima News, 26 September 2007. Archived 23 February 2008 at the Wayback Machine. ↑ Burmese junta raids monasteries, arrests over 200 monks Mizzima News, 27 September 2007. Archived 23 February 2008 at the Wayback Machine. ↑ Insect spray to be used for crackdown on protesters Mizzima News, 27 September 2007. Archived 23 February 2008 at the Wayback Machine. ↑ Jenkins, Graeme (27 September 2007). "Burma troops issue 'extreme action' ultimatum". The Daily Telegraph. London. Archived from the original on 11 October 2007. สืบค้นเมื่อ 27 September 2007. ↑ "Soldater dræber ni i Myanmar". Politiken. 27 September 2007. Archived from the original on 11 October 2007. สืบค้นเมื่อ 27 September 2007. ↑ "Japansk fotograf dræbt i Myanmar". TV2. 27 September 2007. Archived from the original on 11 October 2007. สืบค้นเมื่อ 27 September 2007. ↑ Than Shwe's family in Laos Mizzima News, 27 September 2007. Archived 3 January 2008 at the Wayback Machine. ↑ Troops marching to Rangoon Mizzima News, 28 September 2007. Archived 31 October 2007 at the Wayback Machine. ↑ "Burma-Myanmar Genocide". สืบค้นเมื่อ 10 April 2009. ↑ Rangoon: ‘army mutiny’ reported The First Post Newsdesk special report. Archived 11 October 2007 at the Wayback Machine. ↑ New protests on Rangoon streets BBC News article. ↑ Breaking News – Gambari meets Daw Aung San Suu Kyi Mizzima News 30 September 2007. Archived 11 October 2007 at the Wayback Machine. ↑ 30 Sept ko htike's prosaic collection), 30 September 2007. ↑ Army barricades lifted around key Myanmar temple Reuters, India 1 October 2007. ↑ Resistance to Myanmar Soldiers Continues The Guardian 8 October 2007 Archived 25 October 2007 at the Wayback Machine. ↑ Generals, soldiers jailed for refusing to shoot monks Jakarta Post, 10 October 2007 Archived 11 October 2007 at the Wayback Machine. ↑ "Pro-junta rally to be held in Rangoon". Mizzima. 12 October 2007. Archived from the original on 14 October 2007. ↑ Arakan NLD members jailed Democratic Voice of Burma 18 October 2007 Archived 15 November 2007 at the Wayback Machine. ↑ Bago couple arrested for challenging government protests Democratic Voice of Burma 19 October 2007 Archived 15 November 2007 at the Wayback Machine. ↑ Burma lifts curfew on main cities BBC NEWS | Asia-Pacific | Burma lifts curfew in main cities BBC 20 October 2007. Retrieved 20 October 2007. ↑ BBC NEWS | South Asia | Burma minority 'fleeing to India' BBC, Burma minority 'fleeing to India' Retrieved 24 October 2007. ↑ "The News International: Latest News Breaking, Pakistan News". thenews.com.pk. สืบค้นเมื่อ 16 May 2015. ↑ One month on, Burmese regime stages show of strength Guardian Newspaper online (UK). Retrieved 26 October 2007 Archived 27 October 2007 at the Wayback Machine. ↑ "Yahoo News UK & Ireland - Latest World News & UK News Headlines". uk.news.yahoo.com. สืบค้นเมื่อ 16 May 2015. ↑ Monks return to streets of Burma BBC. Retrieved 2 November 2007. ↑ 'In tiny acts of defiance, a revolution still fickers, The Times, 26 September 2008. ↑ "Myanmar: UN rights expert to probe allegations of abuses during crackdown" (Press release). UN News Centre. 25 October 2007. สืบค้นเมื่อ 25 October 2007. ↑ "US Diplomat Meets Burma Leader". Time. Associated Press. 12 October 2007. Archived from the original on 26 July 2008. สืบค้นเมื่อ 10 April 2009. ↑ AJE – Al Jazeera English Aljazeera News, More protesters held in Myanmar. ↑ "MYANMAR: Monk Receives 68 Years in Prison" (PDF). Amnesty International. 3 October 2008. Archived from the original (PDF) on 29 April 2011. สืบค้นเมื่อ 20 April 2011. ↑  Challenging the Authoritarian State: Buddhist Monks and Peaceful Protests in Burma. vol.32:1 winter 2008. Retrieved 7 April 2009. Archived 16 May 2009. หน้านี้แก้ไขล่าสุดเมื่อวันที่ 18 มีนาคม 2562 เวลา 10:42 น.